For administrative division in the sense of a company department, see Division (business). An administrative division, unit, entity, area or region, also referred to as a subnational entity, statoid, constituent unit, or country subdivision, is a portion of a country or other region delineated for the purpose of administration. Administrative divisions are granted a certain degree of autonomy and are usually required to manage themselves through their own local governments. Countries are divided up into these smaller units to make managing their land and the affairs of their people easier. A country may be divided into provinces, which, in turn, may be divided in whole or in part into municipalities. Administrative divisions are conceptually separate from dependent territories, with the former being an integral part of the state and the other being only under some lesser form of control. However, the term "administrative division" can include dependent territories as well as accepted administrative divisions (for example, in geographical databases). For clarity and convenience the standard neutral reference for the largest administrative subdivision of a country is called the "first-level administrative division" or "first administrative level". Next smaller is called "second-level administrative division" or "second administrative level". In many of the following terms originating from British cultural influence, areas of relatively low mean population density might bear a title of an entity one would expect to be either larger or smaller. There is no fixed rule, for "all politics is local" as is perhaps well demonstrated by their relative lack of systemic order. In the realm of self-government, any of these can and does occur along a stretch of road—which for the most part is passing through rural unsettled countryside. Since the terms are administrative political subdivisions of the local regional government their exact relationship and definitions are subject to home rule considerations, tradition, as well as state statute law and local governmental (administrative) definition and control. In British cultural legacy, some territorial entities began with fairly expansive counties which encompass an appreciably large area, but were divided over time into a number of smaller entities. Within those entities are the large and small cities or towns, which may or may not be the county seat. Some of the world's larger cities culturally, if not officially, span several counties, and those crossing state or provincial boundaries have much in common culturally as well, but are rarely incorporated within the same municipal government. Many sister cities share a water boundary, which quite often serves as a border of both cities and counties. For example, Cambridge and Boston, Massachusetts appear to the casual traveler as one large city, while locally they each are quite culturally different and occupy different counties. General terms for these incorporated places include "municipality," "settlement," "locality," and "populated place." For a more comprehensive list, see List of terms for administrative divisions. Due to variations in their use worldwide, consistency in the translation of terms from non-English to English is sometimes difficult to maintain. Sovereign state, a national or supra-national division. Country, a national or sub-national division. 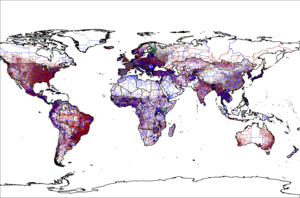 GADM, a high-resolution database of country administrative areas. ISO 3166-2, specifically Codes for the representation of names of countries and their subdivisions — Part 2. ^ "Global Administrative Unit Layers (GAUL)". FAO. Archived from the original on 1 May 2014. ^ "Core Geo-Database". United Nations Geographic Information Working Group (UNGIWG). Archived from the original on 1 May 2014. Wikimedia Commons has media related to Country subdivisions. Statoids, an international convention with standardized two-letter-based multi-level summaries of administrative divisions worldwide (e.g. GH.AH.AS represents Adansi South (AE) in the Accra Home (AH) region of Ghana (GH)).